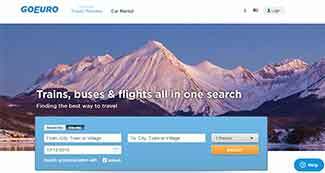 Berlin-based GoEuro Corp founded by India-born Naren Shaam, which operates GoEuro.com, a multi-modal travel search and ticketing platform for European destinations, has secured $45 million (around Rs300.69 crore) in a Series B round led by Goldman Sachs. The new investors in this round include global technology investment firm Atomico, Russian billionaire investor Yuri Milner, Tom Stafford, a partner with Milner at DST Global, Sebastian Siemiatkowski, CEO and co-founder of e-commerce payments solutions provider Klarna, and Ilkka Paananen, CEO and founder of Finland-based gaming startup Supercell. Existing investors Battery Ventures, Lakestar and New Enterprise Associates also participated in this round. GoEuro said that the funds will be used for expansion, product development, partner integration and to make new customer acquisitions. "It will allow us to further accelerate our growth, and continue to build the most comprehensive platform for rail, bus and air travel in Europe," said Naren Shaam, founder CEO of GoEuro, in a statement. "GoEuro has brought the last untapped market within the travel industry. With over 50,000 train and coach stations across Europe, we see an opportunity to fill the void by building the travel platform," said Christopher Dawe, co-head of Goldman Sachs IP Private Investments. Founded in 2012, GoEuro allows customers to search and book rail, bus and air transport across Europe, addressing the needs of an audience that spends 150 billion euros in yearly travel. It has partnered with over 340 European transport operators and offers its services across 11 countries in Europe. GoEuro lists on its platform around 32,000 rail and bus stations combined and 207 airports. Queries sent by Techcircle.in to GoEuro on a possible Indian foray went unanswered at the time of filing this report. Born in India and educated in the US, Harvard alumni Naren Shaam was working at financial services and management consulting group, Deloitte and Touche prior to setting up this venture. During one of his backpack trips to Europe, he faced problems on several instances when it came to choosing the cheapest and best mode of travel. To address this pain point, he moved to Berlin in 2012 and founded the venture. In August 2014, GoEuro raised $27 million in Series A funding, led by New Enterprise Associates (NEA) and others. In January last year, it raised seed fund of more than $4 million in a round led by Battery Ventures, Hasso Plattner Ventures and others.